Simple design and ease of operation with large push buttons make this an ideal choice. Dependable automatic screw and nut drive. Self contained within its own structure. Flexible and modular construction blends in well and enhances all types of environments. Requires virtually no building work. Supplied with complete structure and choice of cladding – steel or glass panels. Hinged manual steel doors (900 x 2000 mm) with self-closers are supplied as standard. Configuration can be front only, front and rear and adjacent openings. 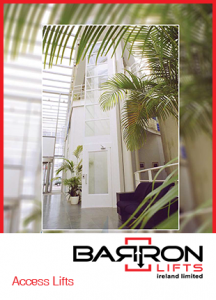 The lift is operated by continuous pressure buttons in accordance with European codes. Each landing is equipped with a call button and the platform has floor designations, emergency stop and an alarm button. The platform console is illuminated by a battery backed up small hidden fluorescent tube. Further lighting is provided in the shaft ceiling. Only a 50 mm pit is required alternatively we can provide a ramp. There is no need for any machine room since the machinery and controller are contained within the unit itself. The lift consists of a platform travelling inside a smooth shaft. It is supplied within its’ own structure of double skinned insulated steel panels or optional glass panels. The L-shaped platform is constructed of steel with non-slip flooring. A 1.1 metre high wall to one side contains the push buttons, emergency lighting and hand rail. Safety edges are fitted to all sides.